When the month of February is there, the air turns romantic. Everyone is busy in impressing his or her love with pleasant gifts for the very special love celebration of the year. Couples wait for this special month throughout the year. All the love, affection and feelings of 11 months came to the fullest on the special moment on February, because Valentines Day falls on this month. 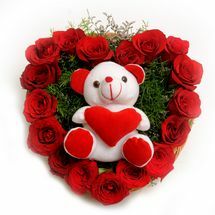 Valentines Day is venerated as a love festival in India as well as abroad. The special day for lovers has a notable weeklong foundation that is denoted as ‘VALENTINES WEEK’. There is a weeklong celebration for the ‘love day’ that instigates from 7th February as Rose day and followed by other 6 more fete days that terminates at 14th February on Valentines Day. To smear love on special one’s life there are seven special days. No matter if you are in a relationship or are looking for someone special, within the seven notable days you can achieve the greatest heights in your love life. Whether its proposing your loved ones on Propose Day, express feeling of love or stretching a hand a friendship through roses on Rose Day, spreading the sweetness in the relationship on Chocolate Day, impress your girl with a pleasant surprise on Teddy Day, making a commitment for love life on Promise Day, feeling the warmth of your loved one on Hug Day, sensing your love on Kiss Day or Putting your entire feelings altogether on Valentines Day, a gift appropriate to mark all these special events can be found online at Elitehandicrafts.com. At Elitehandicrafts.com you can find gift that matches to the weeklong celebration quoting each and every special moment of the annual gala. No matter your valentine lives nearby or you want to convey your feeling through a medium it always carries the same emotions. Send Valentines Week Special gifts, to anywhere across India at attractive price and free delivery through this most relied shopping portal for special V’Day gifts.